thanks to everyone who attended the 2019 Brazen Dropouts Bike Swap! Follow this page for future updates on the 2020 Swap! 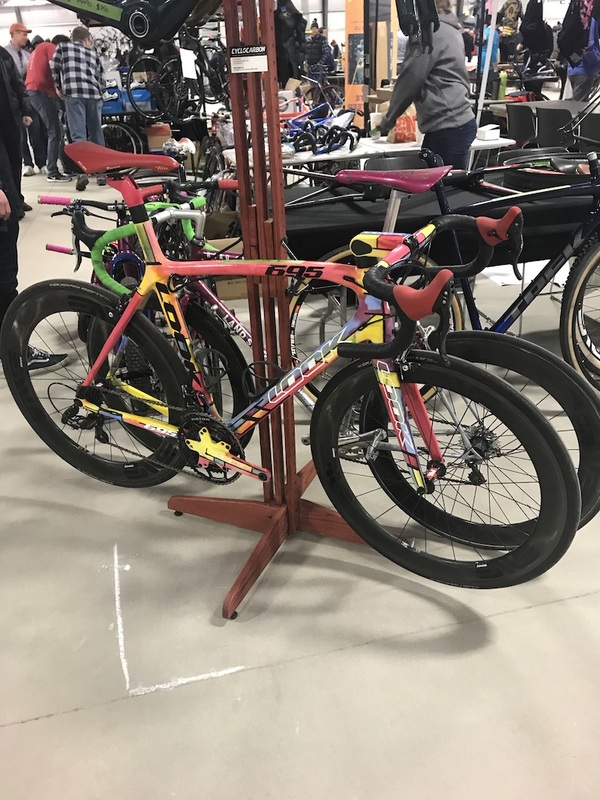 The Brazen Dropouts Bike Swap is a one-day event held annually in January in Madison, WI that connects folks with bike stuff to sell with people who want to buy it. 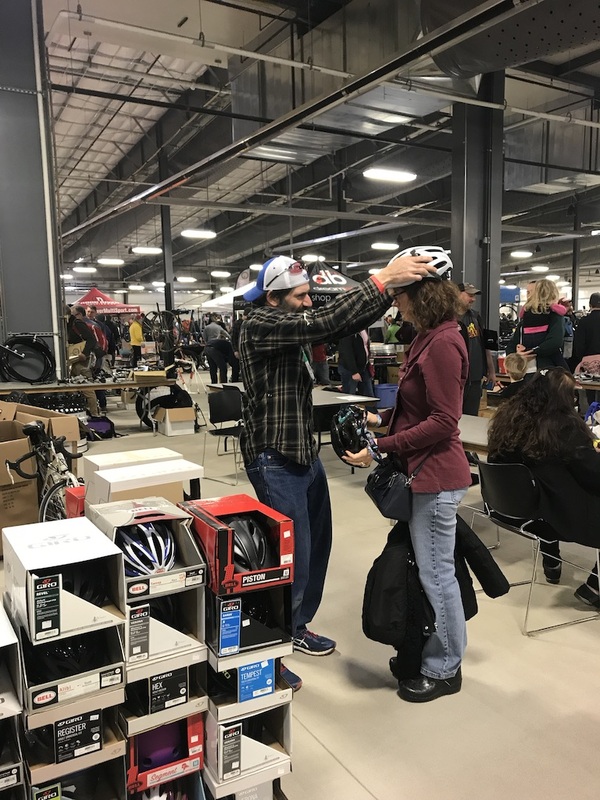 Over 125 vendors register to sell stuff like cycling attire, shoes, frames, forks, cranks, pedals -- you name it, it's probably at the Swap. In 2019, we had approximately 1000 general attendees! The exact vendors vary from year to year, but it's a good bet that you'll find some spectacular deals, and meet a bunch of great people. Additionally, a number of non-profit bicycle advocacy groups attend the Swap - so even if you don’t buy anything, you can learn about some great events and organizations! The Brazen Dropouts don’t take any commission on any sale. Bike Corral - For buying/selling Bikes! The bike corral is ideal for those who have complete bikes to sell. You can think of it like a pumpkin patch full of bikes for Swap attendees to peruse. There's no need to register ahead of time: just bring your bikes to the Swap. For non-vendors, it costs $10 to enter the first bike into the corral (general admission included), and then $5 for each additional bike. 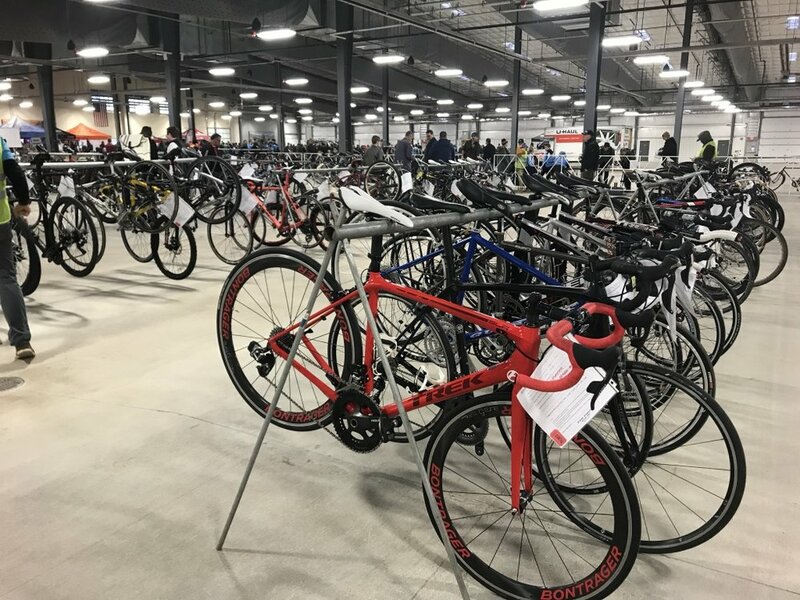 Vendors may enter the first bike into the corral for free (per paid vendor table/end-row/expo space), and each bike after will be $5 (all payment accepted only the day of the Swap - no pre-registration). See the link above for the form for the corral - you’ll fill this out, we’ll attach it to your bike, and make sure that any interested buyers get in touch with you directly while you shop the Swap. Non-vendor bike sellers may enter the main entrance of the building starting at 9am to get your bike into the corral and get a general admission wristband. Tables - For Selling anything! We have about 130 tables available, with each total space approximately 5' x 10' and including a table with two chairs, which comprise the majority of the floor. You can register as many tables as you'd like, and we'll be sure to situate them next to one another. You can sell anything at a table! We just ask that you don't move them, keep the aisles clear, and don't spill over into someone else's space. If you represent a non-profit, please get in touch to inquire about spaces we have available to you. These spaces, which will be located at the ends of each vendor table row, will be approximately 10' x 10' and will allow you to create your own set-up. No table or chairs will be included in these spaces at the standard rate, but vendors can bring anything they want to set-up their space. Only 20 of these spaces will be available, so sign-up early! Expo Spaces - For Selling Anything! In STyle. "Expo spaces" are 10' x 20' spaces situated front and center at the venue. These spaces are designed to allow free-form presentation. Some vendors set up a small tent over their space, bring their own fixtures, and set up a small pop-up shop. Others need only the two tables and chairs provided with every space, but want to situate them differently than the vendors tables mentioned above typically allow. Our gracious sponsors have provided items for hourly raffles - each general admission entry and each purchased vendor space will receive one raffle ticket for free (further raffle tickets can’t be purchased). Send us an email or ask us on Facebook. The Swap email isn’t monitored closely during the Swap off-season, so message us on Facebook if you don’t hear back. Who can sell stuff at the Swap? Anyone! Our vendors run the gamut from folks who have too many bike components on their workbench to long-standing bike shops and cycling brands. We don't do any curation of vendors aside from encouraging past vendors from returning to the Swap and spreading the word about the Swap, so the mix is fresh every year. What Can I find at the Bike swap? As mentioned above, the vendors at the Swap change from year to year, so it's impossible to nail down exactly what's available. However, it's a good bet that you'll find some great deals on just about anything cycling. We get all sorts of complete bikes, frames, forks, components, wheels, tools, clothes, accessories, even art. How do I pay for stuff at the swap? Most sellers will prefer cash for purchases, and will rarely ever accept a check. Some vendors may have Venmo, PayPal, or other services set-up on their mobile devices. An ATM is available on-site, but isn’t guaranteed to be stocked with the cash you’ll need. For general admission and corral entries, the Brazen Dropouts prefer cash, but will also have credit card readers for 2019. Will there be Food at the Swap? Yes. The Alliant Energy Center runs a concession stand that typically serves hot food (brats, popcorn, soft pretzels, etc) and cold drinks (soda, beer!). Enter your email address below, and you'll receive piping-hot Swap announcements and updates. We'll never sell, publicize, or do anything nefarious with your email address. And we'll keep the chatter strictly Swap-related. We're cyclists, not creeps. You should receive an email asking to confirm your subscription momentarily. See you at the Swap!